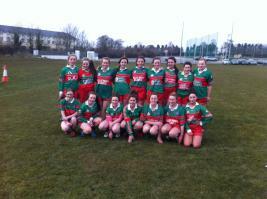 The girls had a great win against a previously unbeaten Castleknock team. We arrived out to the castleknock complex missing a number of players and had to call up the services of Kellie from the u14s to help out at the last minute. This taller castleknock team looked ready for a match and were being put through their paces by their coach as we arrived . After a warm up by Barrog we were ready to go and straight from the start we put the castleknock team under pressure and within a couple of minutes Barrog had scored a goal. This was to set the tone for the first half and with some great movement off the ball by the forwards to make space for the other girls to attack the castleknock goal , allowed us to score another 3 goals and 3 points before the half time whistle. Our defenders had a fantastic first half against the wind and restricted a very skilful castleknock forward line to 3 points for the 1st half. The 2nd half wasn't as high scoring as the first and much tighter - the castleknock girls made a number of changes to halt the Barrog scoring. The barrog girls had numerous chances to score but were thwarted at the last second by some brave defending. Every one of the barrog girls fought from start to finish against a bigger/stronger opposition and it would be hard to single out any performance as they were all brilliant . Special mention has to go to Shona who stepped up to the plate and played in goal for the team at the last minute and had a great game.